A few weeks back, the Painting and Decorating Association asked me if I would like to write a Case Study article about how I go about Hand Painting, James Mayor Furnitures’s bespoke kitchens. 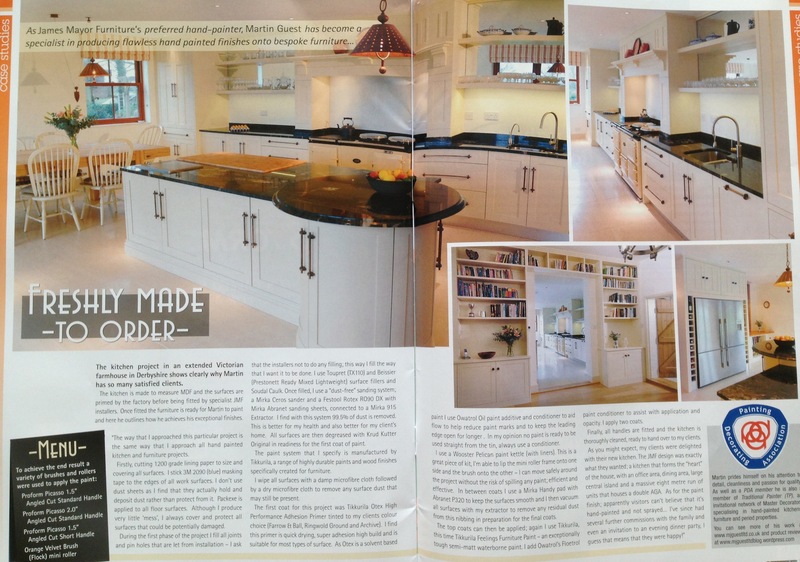 Above is the resulting Double Page Spread, appearing in the April – May 2013 edition of “the decorator”. In the article I speak specifically about how I prepare James’ MDF cabinetry, what tools I use and what materials I think are best for the job. Later in the year I will be writing more Case Studies for the PDA magazine. For more details about my hand-painted furniture and kitchens, please visit www.mjguestltd.co.uk or my Traditional Painter profile page. This entry was posted in Uncategorized and tagged Furniture Painter, Kitchen Painter, Master Decorator on April 8, 2013 by mjguestltdblog.